Imitation is the sincerest form of flattery, the old saying goes. But what happens when you look over the fence at the bloke down the road and it fills you with complete dread? Why is he doing so well? Why aren’t I as good as him? WHY DIDN’T I THINK OF THAT?!? It’s bad enough living with your own self-doubts, comparing yourself to others can bring on a gut wrenching level of comparison-itis. If you’re anything like me, comparing yourself to competitors, or people that you admire, gives a boost and a drive to do better than them. For those who don’t fall into this bucket, I have a simple method to deal with the dangers of comparison-itis. Knowing what someone in my industry is doing better than me pushes me to do a better job. Not in a way where I have a killer drive to win against them, but in a way that I want to be the best I can be and make sure my business is too. Being the best I can be is about taking risks and seeing which ones pay off, and learning from the ones that don’t. If I had no competition then I would have no benchmarks other than my own success, not a bad way to be, but it can lead to stagnation. A lot of business owners I know don’t take the time to celebrate their successes. They hit a target and then immediately move onto the next target. Stopping and celebrating the benchmarks of your business, no matter how big or small, gives you time to absorb the fantastic job you are doing. This has the knock-on effect of giving you a boost of confidence, so when you fall into a spot of comparison-itis you can pull yourself back up by your own successes. If I fall into a place where I’m comparing myself with the bloke down the road, I’ll go down and talk to him. Almost every business owner I’ve ever met is happy to share information and tips in being more successful. Sure, you probably won’t roll out your entire business strategy to them, but reaching out and sharing what you do will only create a good network around you of people who can help when things get tough. At the end of the day, I would always help someone who came and asked, and there are a lot of other people just like me. No one can do what I do the way I do it because no one else is me. That’s a simple mantra I run through my head when I get low. Everyone is unique, comparing yourself to others or constantly judging yourself through that lens will never do you any good. Comparing yourself and your business to others can be a winning approach if used as a tool to better yourself. If you use it to let the negative take control, then you are not doing it to succeed. 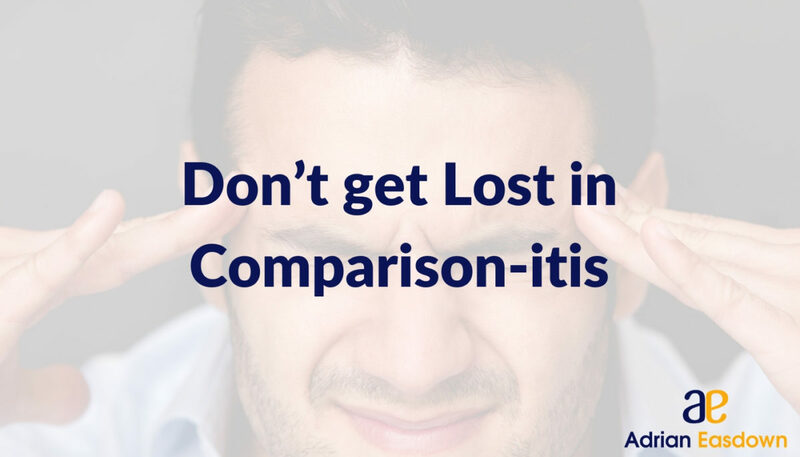 Don’t get stuck in comparison-itis, get stuck in the competitive race to succeed.